Democratic and Republican Candidates Come Together | Kid Reporters' Notebook | Scholastic Inc.
Donald Trump speaks at the "No Labels" event in Manchester, New Hampshire. In presidential election years, New Hampshire is traditionally the first state to hold primary elections. That's one reason so many candidates flock there early. The state is already abuzz with political activity. 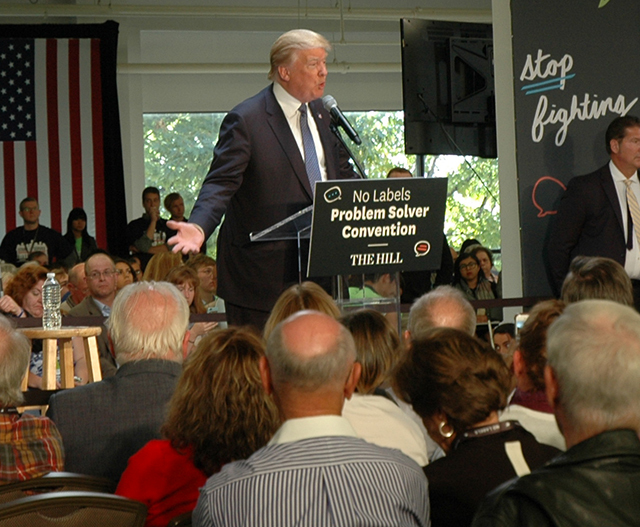 On October 12, billionaire businessman Donald Trump, a Republican, joined Vermont Senator Bernie Sanders, a Democrat, and six other presidential candidates in Manchester for the first-ever “No Labels Problem Solver Convention." On the Republican side, South Carolina Senator Lindsey Graham, New Jersey Governor Chris Christie, Ohio Governor John Kasich, and former New York Governor George Pataki also attended. Democratic candidates included former Maryland Governor Martin O’Malley and former Virginia Senator Jim Webb. The No Labels Foundation is led by former Utah Governor Jon Huntsman, a Republican, and former Connecticut Senator Joe Lieberman, a Democrat. The group seeks to promote cooperation between the two political parties in order to solve the country's problems. Saying that it is time to “stop fighting and start fixing,” No Labels is focused on such goals as job creation and deficit reduction. At the event, Lieberman motioned to the audience of 2,000 voters, saying, "Where did these goals come from? They came from you." He encouraged candidates to "rise to a higher ground" and spoke of the dangers of not “reaching across the aisle.” When leaders from both parties come together, Lieberman said, the United States can accomplish much more. Each candidate described his support of the No Labels mission and explained how he would further it as president. Like other candidates, Trump looked to the past for inspiration. “I know you’ve heard this before,” he said. “Remember [Republican President Ronald] Reagan and [Democratic Speaker of the House Tip] O’Neill. They were two people with very different views, but they got along. They got things done." As the day began to wind down, Graham asked the audience: “Is America worth fighting for?” The crowd cheered. “Is America worth compromising for?” The crowd cheered even louder.